Now, whether it's a new trailer we don't know. According to website Final Fantasy-XII.net, the clues to what the site can be found by decompiling the game site's flash. Forum member byoushinn discovered two files called "ff13-trailer-sd.flv" and "ff13-trailer-hd.flv" in the official FFXIII site's flash. So two trailers, we assume, one HD. 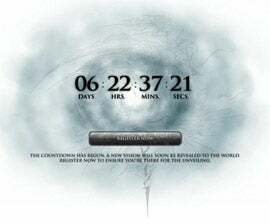 The countdown site (ungh, countdown site) does state: "A new vision will soon be revealed to the world." Even if there is not a new trailer, we could at the very least be getting the game's first HD trailer. Think of it as a consolation prize — in high definition.